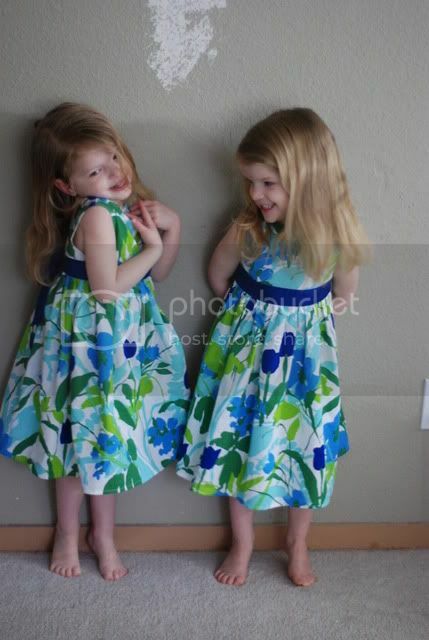 The Twins ‘Natalie’s Dress’ Easter Dresses – Everything Your Mama Made & More! 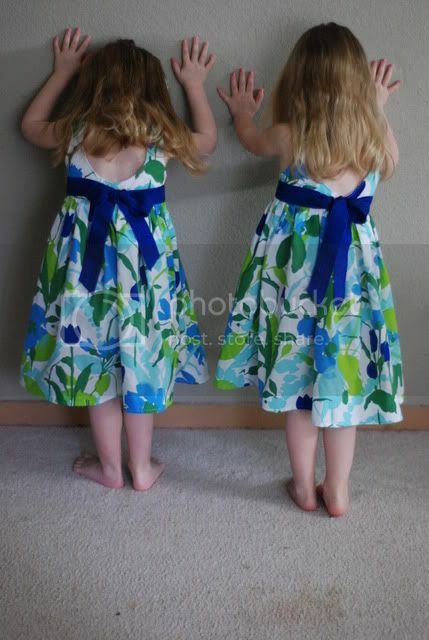 I actually got the twins Easter dresses done nice & early for once. 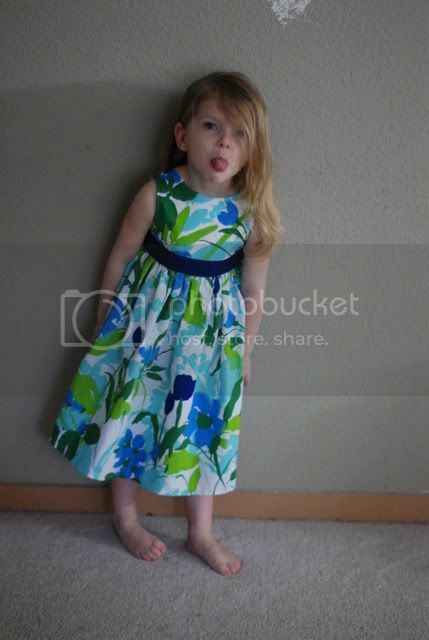 I bought this fabric last year but loved the dresses I made with the test fabric so I just used those & saved this. So after seeing that I didn’t like what I was seeing in stores, even the Gymboree stuff, I got very excited to make these but I knew if I wanted them done I needed to start NOW. I LOVE the cobalt tulips on it, it is a different color palette then you normally find most Easter dresses (I’m not one for pastels) and it is dressy yet casual at the same time. I can see them wearing them all spring & summer. I love how they turned out, as do the girls. Now I just need to get more of the ribbon to make them headbands with flowers to match. 1.) I gathered the skirt instead of hand pleating it… it was easier & I like the look better. 2.) Instead of doing fabric ties sewn into the side seams I made the dress & then found pretty 2″ ribbon to match… I sewed it on the front of the dress from side seam to side seam with stitching on the top & bottom edge of the ribbon which left ties on both sides. I used 1 yard of ribbon on each, but I think 1.5 would work better for longer ties/bigger bows. 3.) I found that there really isn’t room for 2 buttons, so I just used one small pearly one instead. 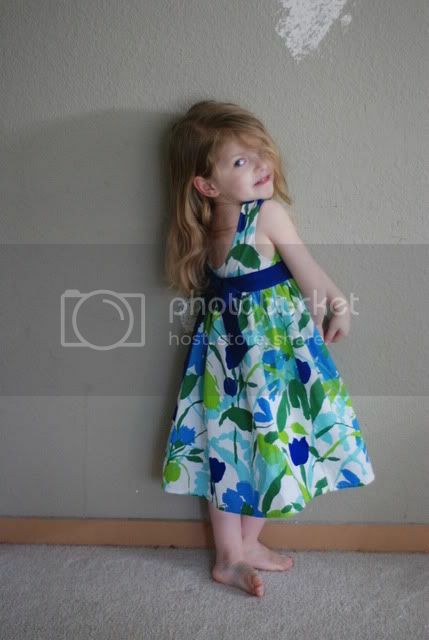 Here is their mini-photo shoot… I will get better ones later when they are all decked out… and yes Baylie thinks shes a super model! Baylie on the left, Carlie on the right! Love the bright blues and greens for spring and goes so well with their colorings. Beautiful, mama. LOOOOOOOOOOOOOOOOOOOOOVE IT! 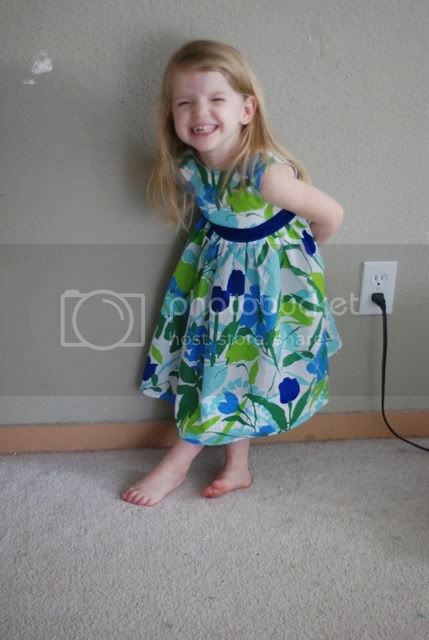 The girls make this dress sooo much cuter! Any chance we’d see a tutorial? or can I email you a few questions? Please? Please? Please? Please? Sorry not tutorial, it is a purchased pattern that has lots of great pictures :). If you have the pattern & have a specific question I may be able to help you. 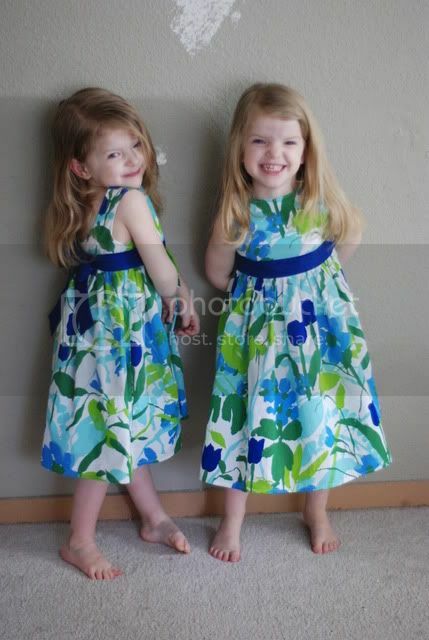 Adorable girls and beautful dresses! Such gorgeous dresses on such pretty girls! I love the large scale pattern and colors of the fabric. The length of the dresses is awesome! About how much fabric did you need for the dresses? 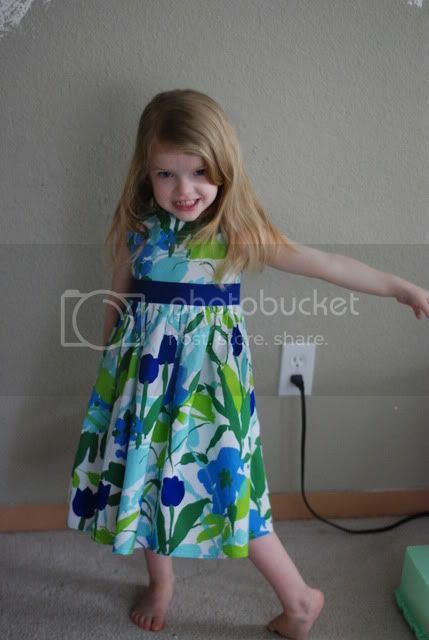 My little girl will be 2 in May, and I’d like to make her on with some fabric I bought a while ago. The dresses turned out beautifully! I think it called for 1.5 or 2 yards? Honestly I don’t remember.